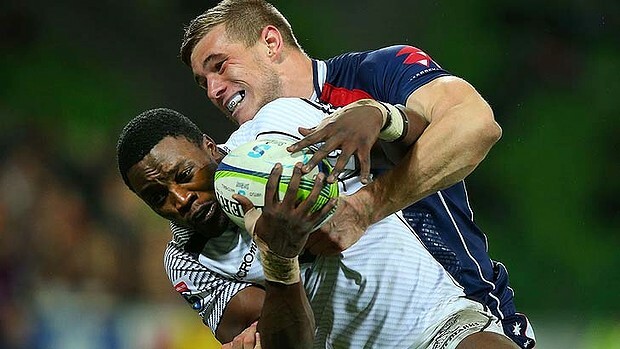 The Cell C Sharks defeated the Melbourne Rebels 28 – 14 in Durban. It was a close first half, with both teams looking dangerous in attack, and scoring plenty of points. The Sharks dominated the second half, controlling possession and field position, and converting the pressure into points. Much like last week, the Rebels faded in the second half, unable to crack the Sharks defence. The Rebels again go home empty-handed from a SA tour. The Sharks were on the attack early, putting together sustained phase ball pressure, earning good field position. From a lineout deep in the Rebels 22, the Sharks spun the ball to Daniel du Preez, who broke the tackle of Cottrell and score a try under the sticks. Robert du Preez made no mistake with the kick, scores 7 – 0 Sharks. The Sharks increased their lead through a successful penalty kick form du Preez. Scores 10 – 0 to the Sharks after 17 minutes. At the restart, it was the visitors turn to attack. A lineout deep in Shark territory set Cooper with great field position, who spun the ball wide to an unmarked English on the wing, who scored the try. Cooper successfully converted, scored 10 – 7 to the Sharks. From the restart, the Sharks gathered possession and go immediately on the attack. The Rebels defence held tight but conceded a penalty for offside. Robert du Preez made no mistake with the kick, scores 13 – 7 Sharks. The Rebels hit back, with some great ball running from Meakes and Jones. Quade popped a pass to a running Maddocks, who dodged one tackle and scored under the posts. 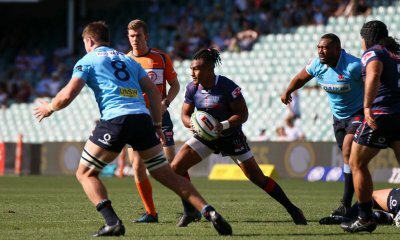 Quade made no mistake with the kick, and the Rebels were in front 14 – 13. In the shadows of half time, the visitors once again conceded another penalty, this time for not releasing. 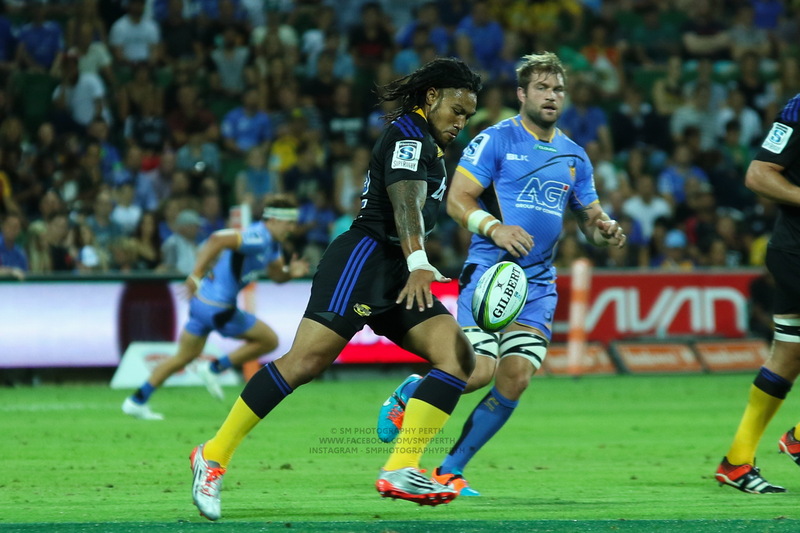 The kick from Robert du Preez was good, and sharks went to the break with a 16 – 14 lead. The Rebels went immediately on attack, with a good run from Cottrell. Earning a penalty, the visitors took the lineout on the Sharks 5m line. The Rebels pounded the Sharks line, and almost looked over, but were denied by a solid Sharks defence line. With momentum behind them, the Sharks work rate lifted significantly. Basic handling errors from the Rebels in open play were punished by the Sharks, setting up good field position to launch raids into Rebels territory. A lineout deep in Rebels territory, followed by a number of forward hit-ups, put the Rebels defence line under immense pressure. With all Rebel defenders committed, Chreuder found an unmarked Robert du Preez out wide, who scored an easy try. He converted his own try, scores 23 – 14 to the Sharks. The Sharks increased their lead soon after the restart with a wonderful try to Manpimpi, who zipped past the Rebels line to score in the corner. Robert du Preez missed conversion, scores 28 – 14 Sharks. 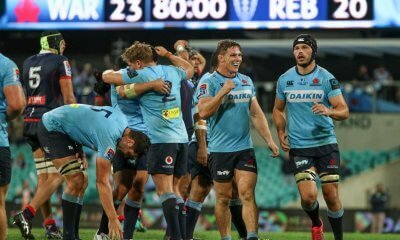 With their opportunity for a first win the republic fading fast, the Rebels launched a number of raids into Shark territory, only to lose possession through poor handling and mistimed passes. Manpimpi almost scored another try, however an ill-timed coat hanger from Marius Louw earned him an early shower, and the Rebels a penalty. As full-time hooter sounded, the Rebels will lament another lost opportunity. For the Sharks, a solid home win: 28 – 14. The first five minutes of the second half. I’m still not sure how the Sharks held out the Rebels and didn’t concede a penalty. It seemed to give them a new level of confidence. Likewise, the Rebels seemed to lose pace with the game, making a number of uncharacteristic handling errors. This week the GAGR MoTM is Robert du Preez. He played a good all-round flyhalf game and scored 16 points. He wins bonus points for the best moustache out on the field. With most of the Wallaby contingent back home, it was a chance from the fringe players to shine. Cottrell, Jones, Maddocks, and Cooper had good games. Meakes tried hard but made a few handling errors. Reece Hodge was quiet on the wing. Morning GAGR’s. A bad week to rest some of your best players. The lack of Genia was telling. Good to see Cooper conitnuing his good form. MAddocks as well. Let us see what the Johnny rebs can do next week. A tour to SA is always hard. Let us see how the other Aus SR teams do over there. Yep. Genia’s addition to the team is massive. With him and Coleman playin I think it would have been a very different contest. YEp. I reckon it would have been a victory to the Rebs. I was wondering how these enforced rests might affect results. Not wanting to detract from the Tahs win, alaways good to put one over the Saders, but that was not their full side by any means. Nope and having just finished watching the game, that was the worst Saders performance I have ever seen. Rang one of my Kiwi mates, and his wife answered becasue he was out in the back yard burning his Saders jersey! I think they rested the players for the wrong game. Yes and no. Yes, because despite Fox proclaiming “Cheika’s a big proponent of Cooper’s,” reality is that he wasn’t anticipated to be Wallaby contention. And it’s still very debatable whether he could ever be picked over Foley, regardless of the form of either player. But no, because he wasn’t a returning Wallaby (i.e. no November Tests), he didn’t play at all last year, and you’d expect it’s going to be Wallaby squad members who’d be rested, and he’s not been in a Wallaby squad since Cheika told him to go and show he’s enjoying his Rugby. Well that all makes sense. I genuinely hope Cheika keeps an open mind on all positions. I thought they might rest all the squad throught out the season that went to Sydney earlier. I dont think so. He isnt in the squad per se. Also none of the other ‘additionals’ that have been invited to attend camp as well havnt been rested. What was the final penalty count in this game? Is there any suggestion of one-sided refereeing or undue poor discipline from the Rebels again? I only saw the end of the first half. At that point the penalty count was 9-2 against the rebels. From when I started watching the penalty count seemed even-ish, although the Rebels do seem to have a discipline problem. The main problem in the second half was turnovers. The number dropped balls was bad. What was worse was the number of times an overload was thrown to a Stormers player because the back line had been shutdown. There was some really, really dumb play. The Rebels were more discipilined in the second half, but looked equally as tired. Similar to last week, I think fatigue set in. Highlight for me was a scrum penalty when big Pone was on the field – massive shove through the TH side, and his 135KG played a part. Don’t know about “one-sided refereeing..” (I missed the game…) but how did the Ref not give a red card to Louw? How did the TOM judge that to be a ‘yellow card’ offence? I thought the Ref referred to the TOM as “Marius”…so the infamous Marius Jonkers? Bet a penny that if the tackler was an Aussie the card would have been a red colour…. That game was there for the taking. Abysmal handling decided the game.